Cyber Ethics is about sharing and using words, images, and video in a safe and ethical manner. The key to being a positive Digital Citizen is to show respect for others and yourself. 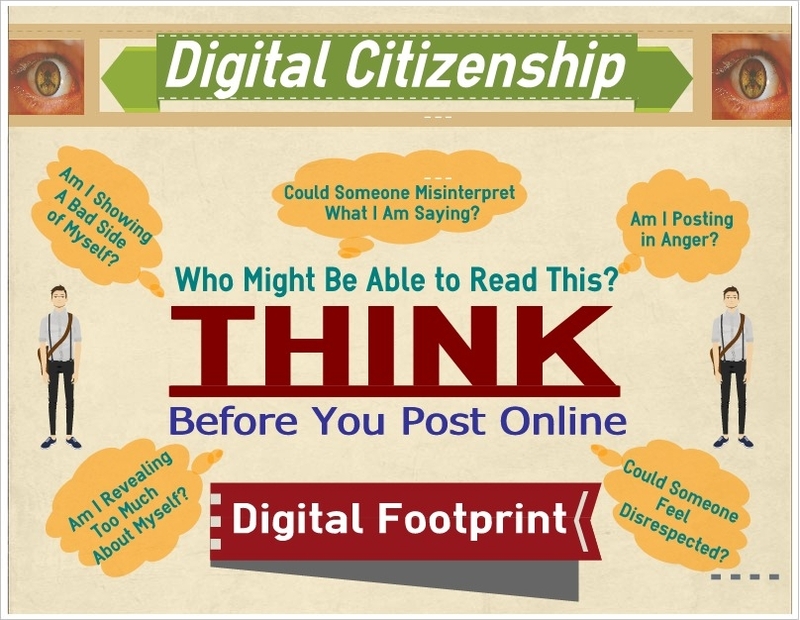 Think before you post! Online modules broken down by: Protect, Connect, Learn, Work, Publish. Cyber Ethics Games, Videos & Quizzes. Online modules broken down by : Our Generaztion, Interpretation, Activism & Innovation. 30+ Inspiring kids teach the world how to be a good digital citizen. Add your story! Create strong & easy to remember "passphrases"
How to create secure Passwords to keep your identiuty safe. Use Electronic Frontier Foundation's word list & die to create strong passwords. "Too Much Information" from Firefox explains where your personal data goes & what your can do about it. Mozilla's campaign for encryption and your privacy. Manage your google privacy settings. Tool for blocking spying ads and invisible trackers. Browser extesion for stopping trackers. Firefox add on allows you to see who's tracking you online. Data Selfie is a browser extension which lets you watch where your Facebook data is goind. "Five day plan to take back your digital identity"
A personalisation engine that accurately predicts psychological traits from digital footprints of human behaviour. Impactful blog post about a Romance Scam.